One of the most interesting things about writing a blog is reading other people’s’ blogs. By doing that, I think I’ve found a lot of kindred spirits with several of my obsessions…Books/Reading…Photography…FOOD!! 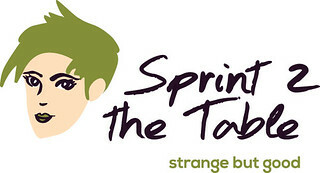 So why not join everyone who is playing along with Strange But Good over at Sprint 2 The Table, hostessed by the lovely Laura. This link up is starting to rev up and everyone loves to hear your comments, so be sure to stop by. This is not what I intended to write about for Strange But Good. However due to certain circumstances, Ralph and I found ourselves at one of our favorite diners yesterday, The Meadows in Blackwood. When I’ve told people about it, they’ve thought I was crazy. It’s not That strange, but some people can’t seem to think creatively! 😉 In fact several times when I’ve ordered it, a waitress will say, “You want the What? ?” I get the feeling it’s not ordered very often. It’s tasty and filling…two of my requirements. In truth, yesterday’s veggie burger was a little overcooked but still tasty. I’m still trying to find out where they get these burgers. I initially thought they were fresh made and asked if I could get the recipe. Then a waitress told me they were packaged and I asked if she could find out the brand for me. The answer I received after she checked is that the chef will not give out that information. Ok…a “secret” veggie burger. Rarely one to leave well enough alone, I now have a friend who works there. I’m going to put her on a mission. Her husband is a former police detective who worked with Ralph so she’s pretty crafty. If anyone can find out for me she can. I’m going to get her to find out where they get these burgers. No kidding, they’re that good. Remember to stop over at Sprint 2 The Table to enjoy some more Strange But Good foods. 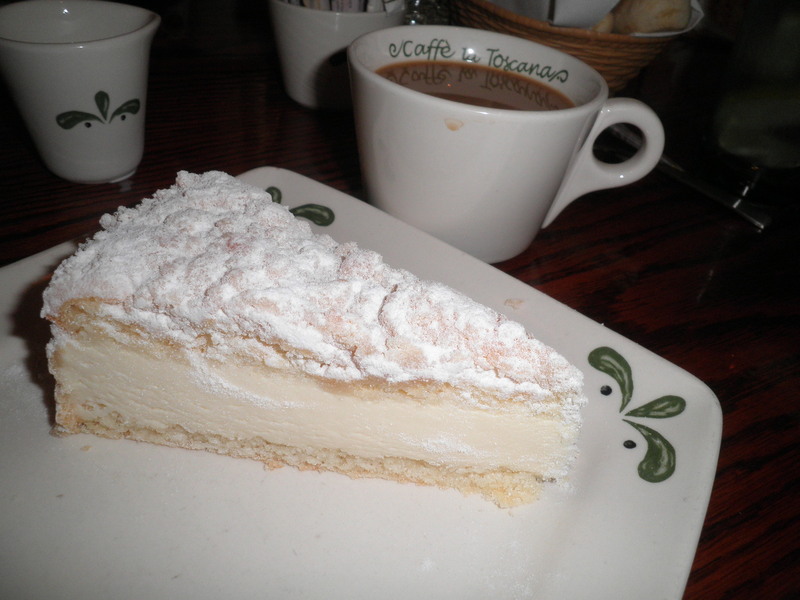 As I prepare to write my What I Ate Wednesday post, I realize that it’s going to look as though I’ve fallen off track. To be honest, it sort of felt that way. But I’m telling myself that it’s just one day and I will be on the (very) straight and narrow until next Saturday (after weigh in at WW) when I’ll be celebrating my birthday. Besides, I HAVE to be good…I only have 7 Weekly Points left!!! 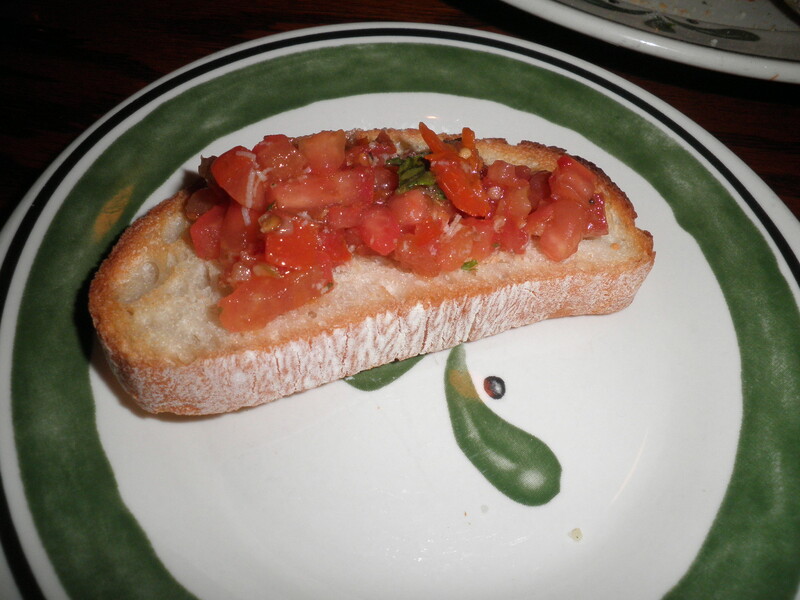 We probably shouldn’t have but we started with bruschetta which is one of my favorite things. 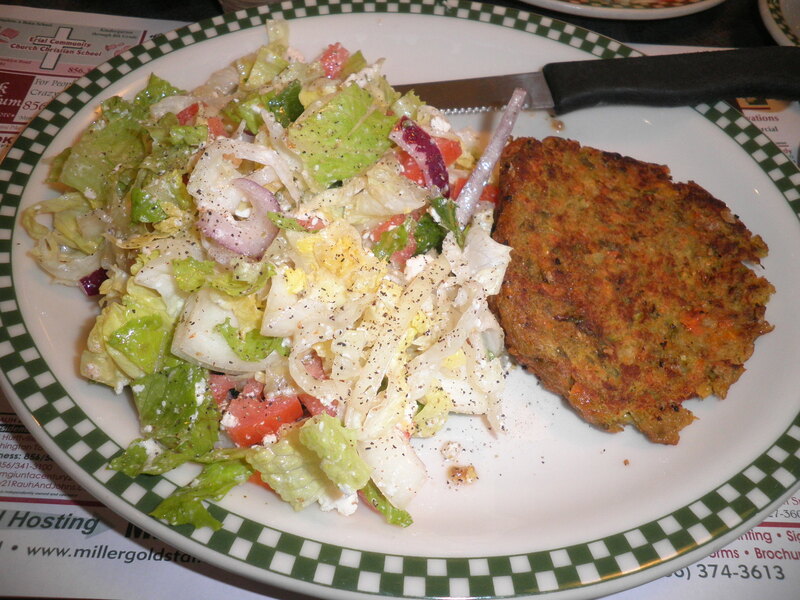 In fact, I think the next time I go, I’m ordering this and salad and that will be it! The world’s largest piece of basil!! The plate after we had already torn into it! 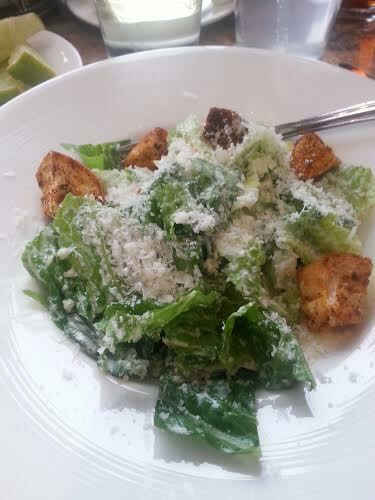 Next was the salad which as always was very tasty. It still bothers me to pay for salad in restaurants because I know how inexpensively it can be made at home. I enjoyed it regardless! 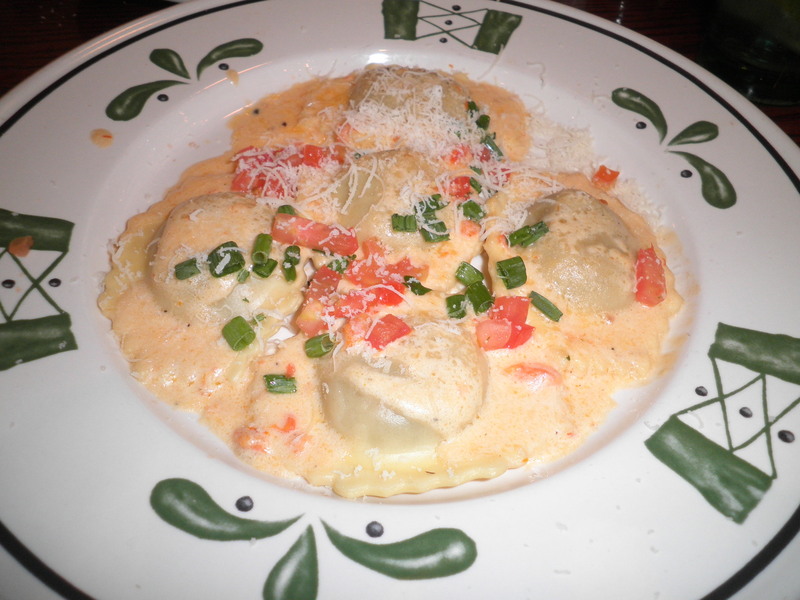 Portobello mushroom ravioli. They were a little dry but still tasted pretty good. The lemon creme cake!!!!! I really can’t use enough exclamation points here! This is so delicious and makes me smile every time I eat it. Their coffee is good to and it was a nice finish to a nice meal. So you may ask, how this fits in to Falling into Good Habits? It fits in because I will as I said at the beginning, be very VERY good for the rest of the week. My plan worked last week and I intend to stick with it. I haven’t mentioned that I have been either walking or riding my stationary bike every day. That really does help. Rainy today so it was the bike for me! I believe That counts as a good habit! So that’s WIAW for Anniversary Day and the beginning of Birthday Month! Be sure to stop over at Peas & Crayons…look around and leave some comments. We all love them! My excitement about getting there paid off. I lost 2 and 1/4 pounds! I felt pretty certain I’d have a loss but that’s better than I expected. All of my caution and mindfulness (obsessing…) over the past week paid off. I tracked and tracked like a crazy person. Interesting that WW is now encouraging an 8 week Countdown Challenge. 8 weeks until Thanksgiving. We’ll have a new mission each week to help us stay on track. The mission this week…Track Your Food! Ok, I think I have this one handled. Seriously though, I think that tracking is perhaps the most useful tool that WW teaches us. I know it makes a huge difference for me. If you’re a WW member or not…if you’re trying to lose or maintain your weight…Write it down! I hemmed and hawed about this next bit. 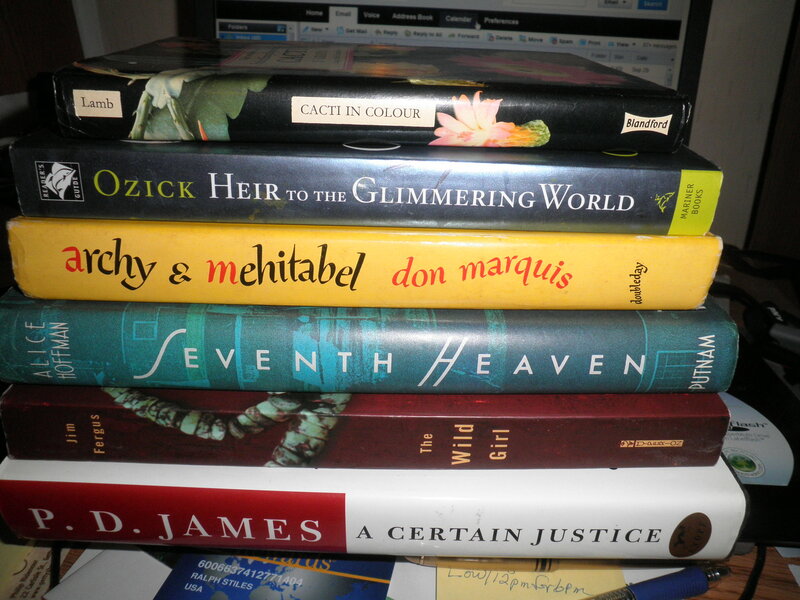 I’ve known for several weeks that Saturday was the county library book sale. I’ve been trying to NOT buy any more books. It’s not the expense because I usually buy them at Goodwill or one of the other thrift stores and they’re either 49 or 99 cents. I just HAVE so many. I finally said, “What the heck!” and asked Ralph if he wanted to go. He said yes…Ele and I had already discussed the possibility of going so off we went. Excited that I found another Alice Hoffman, she’s one of my favorites. I thought the cactus book will come in handy when we get to New Mexico so as Ralph said, “We’ll know which ones have flowers we can cook!” I was so surprised he said that. I’ve never read P.D. James, but I’ve picked up several of hers lately. Think she needs to move to the top of the pile. Got another one by Jim Ferfus when we were in NM and this one looked interesting. We’ll see how it goes. After the book sale, we were all starved and decided to stop at the Harrison House Diner. We don’t go here very often because there are so many other diners closer and a little less expensive but it was close and we had a good experience. Trying to stay on track even though I just weighed in I chose what they call their Neptune Salad. Pretty standard, but that’s what I was looking for. 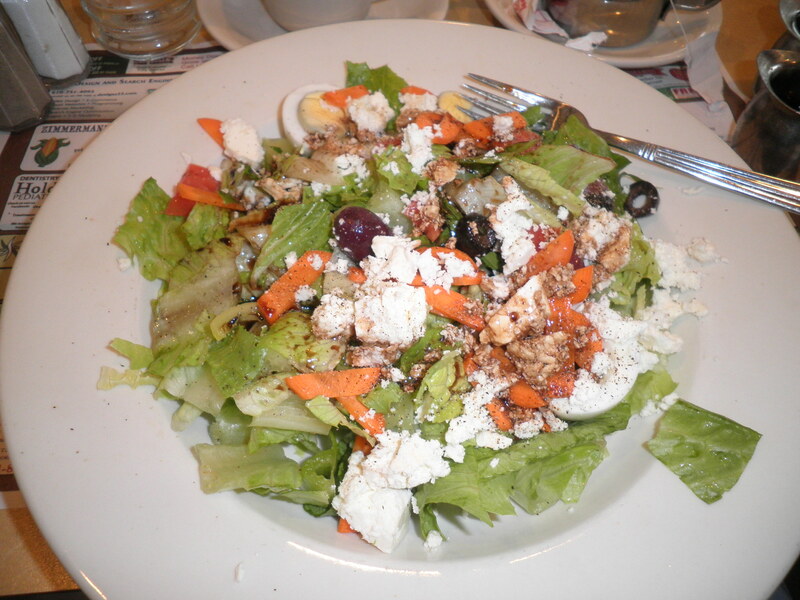 Romaine, carrots, tomatoes, olives, peppers and feta cheese. 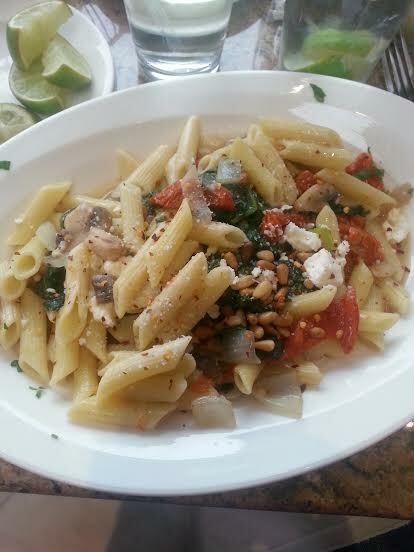 I asked for the balsamic vinaigrette and it was good. They were also very generous with it, 2 little pitchers which was more than enough. Must confess I ate 2 rolls as well which were warm and fresh. Off to see what excitement Sunday holds! But of course we know why we’re here today. Disneyworld may claim to be the happiest place on Earth (we all know it’s actually New Mexico 😉 ) but the happiest Day of the week is Wednesday…Why?? 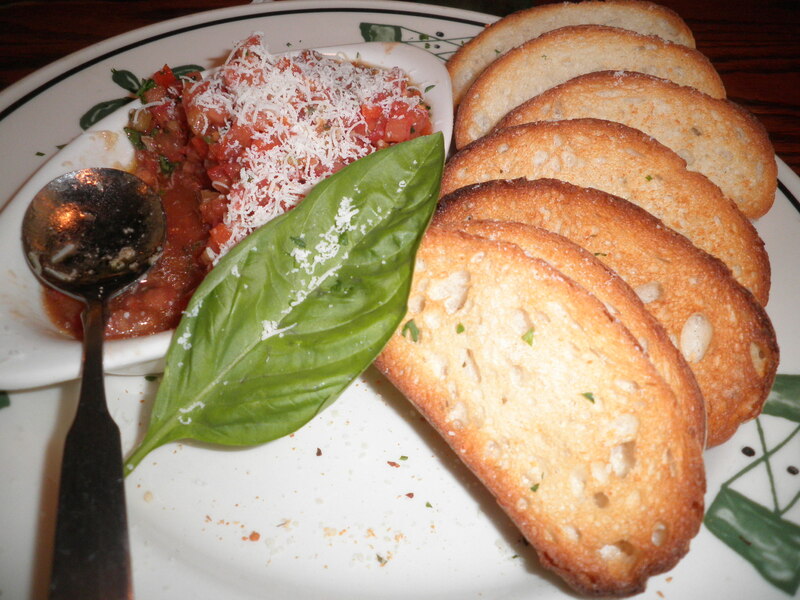 What I Ate Wednesday, Of Course!! It’s the fun and games thought up by Jenn at Peas & Crayons. She just lets us play along! Our theme is still Fall Into Good Habits. I guess I’ve been falling Back into good habits and I am feeling so much more focused and pleased with what I’ve been doing. On Sunday night, I made something that does not photograph well, but was very tasty. 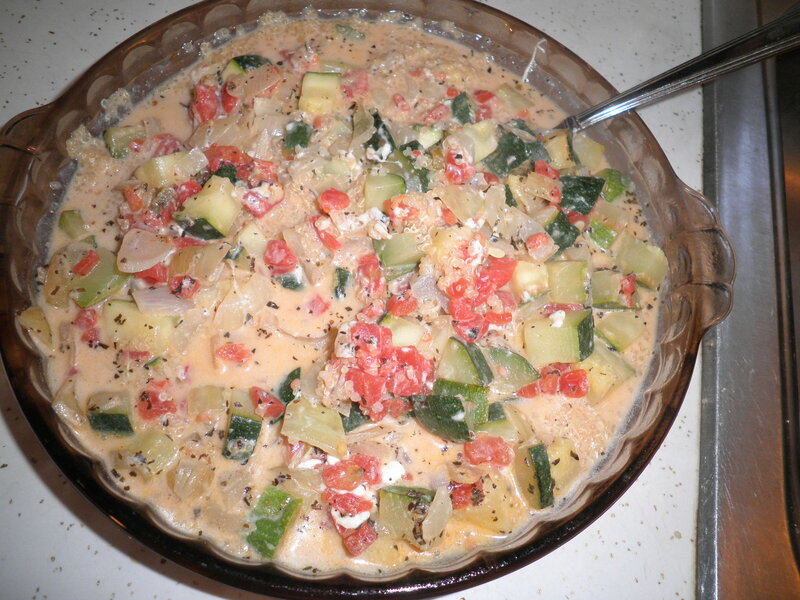 I sautéed up onion, garlic, zucchini and spices with a can of Ro-Tel fire roasted tomatoes with green chile. 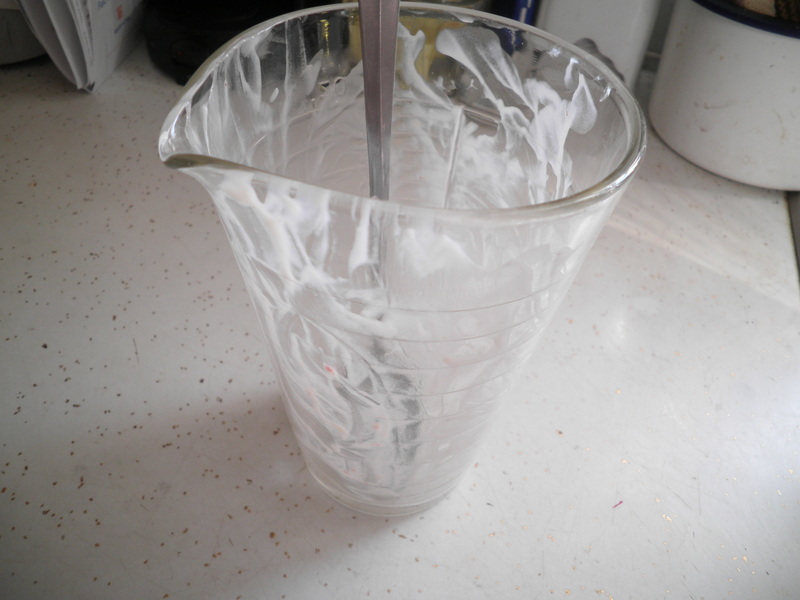 When it was all cooked, I stirred in a cup of cottage cheese. 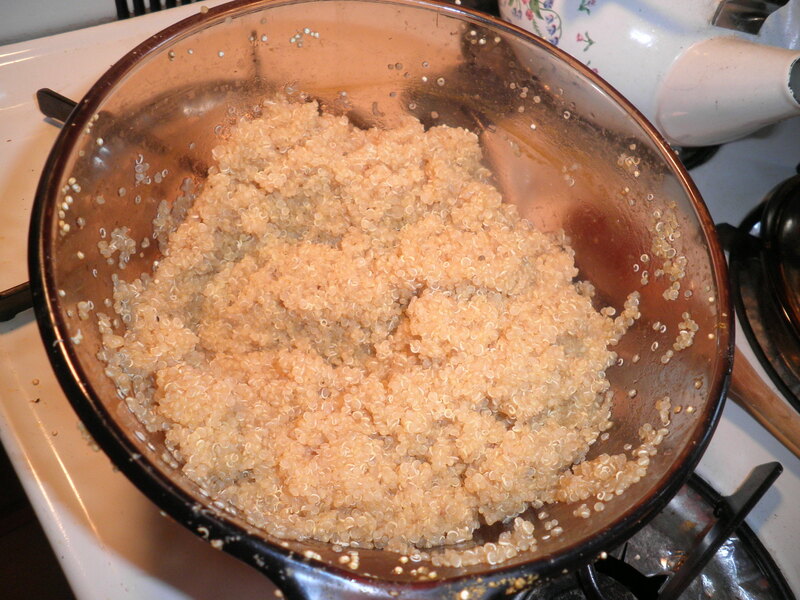 It got all bubbly and gooey and I then poured it all over previously prepared quinoa. This was quick and delicious. It’s great to have some grains cooked up and waiting in the fridge rather than me waiting for them! Monday could have been a slip but I didn’t let it be. Ralph and I took his son Bill out to breakfast for his birthday. I chose wisely. 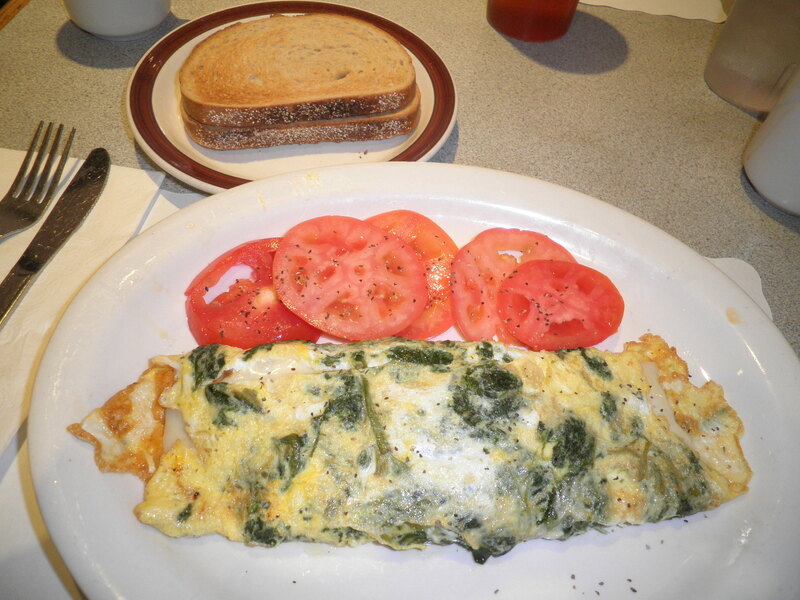 One of my favorite things…a spinach and Feta cheese omelette with sliced tomatoes. Very good. This was my first omelette at this diner and I was pleased. 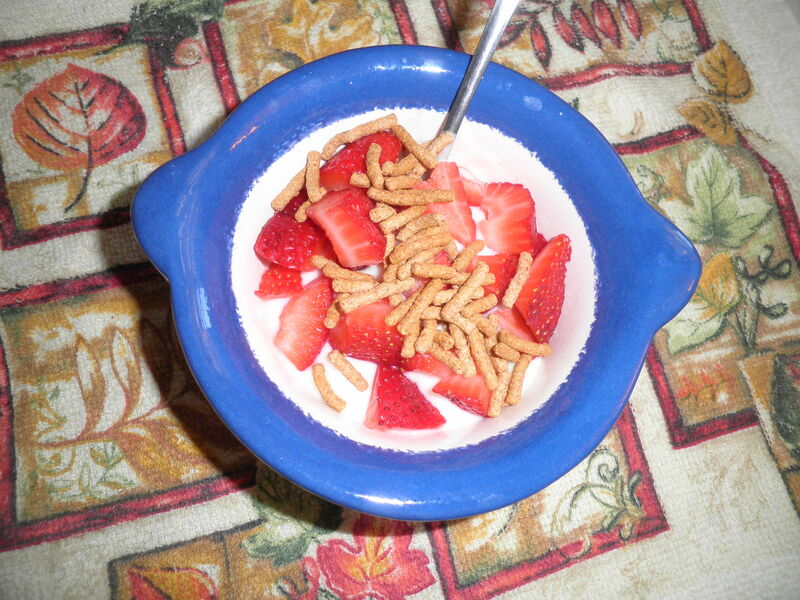 Breakfast on Tuesday was fat-free vanilla yogurt topped with Fiber One and fresh strawberries. Delicious. Love my little stoneware bowl which I got from the “free” box at the church rummage sale! 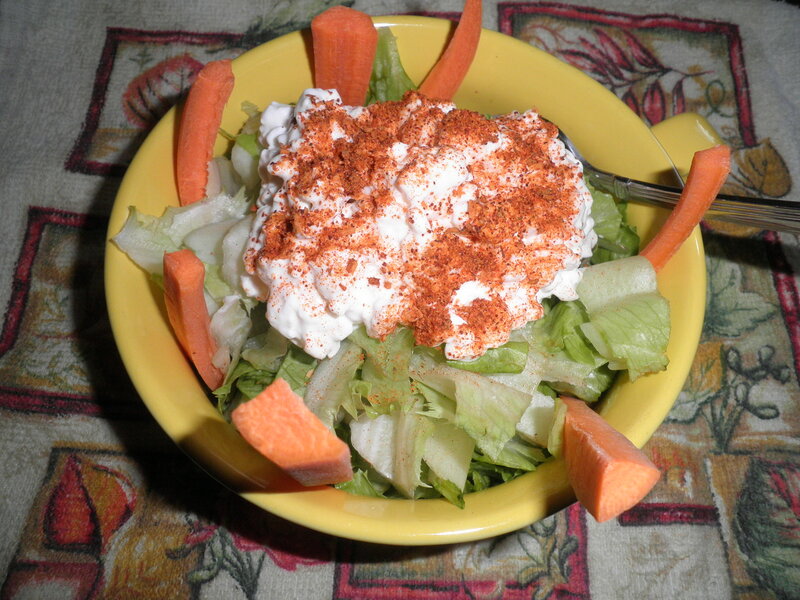 A quick salad of Romaine, carrot sticks and 1 cup of reduced fat cottage cheese topped with Mrs. Dash Fiesta Lime. Very tasty and filling. So what does any of this do with my title-Walking The Walk?? 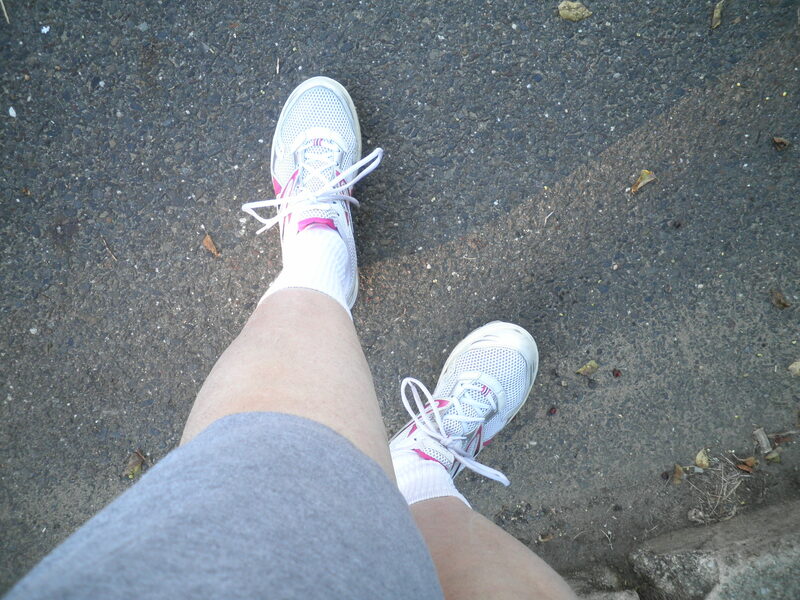 After almost 2 months absence due to traveling, I pulled on my sneakers and got out the door for a walk this morning! I didn’t do the full route I had been doing prior to leaving, but I did about 3/4 of it and it made me very happy. I feel better for having done it and happy for being back in my routine again. So that’s What I Ate Wednesday for me this week. Be sure to make your way over to Peas & Crayons when you’re finished here to see what everybody’s got in the feed bag this week and leave some comments…We ALL love to hear from you! Without even knowing it…I fell into a tradition. Apparently Friday was Second Breakfast Day. That of course is a Hobbit tradition. I feel sorry for any of you who are not familiar with The Hobbit or The Lord of the Rings. I am not a mad, crazy fan like some people I know (who will remain nameless so that I’m not drummed out of the family) but because of my love of food, I certainly can be comfortable with the idea of Second Breakfast! 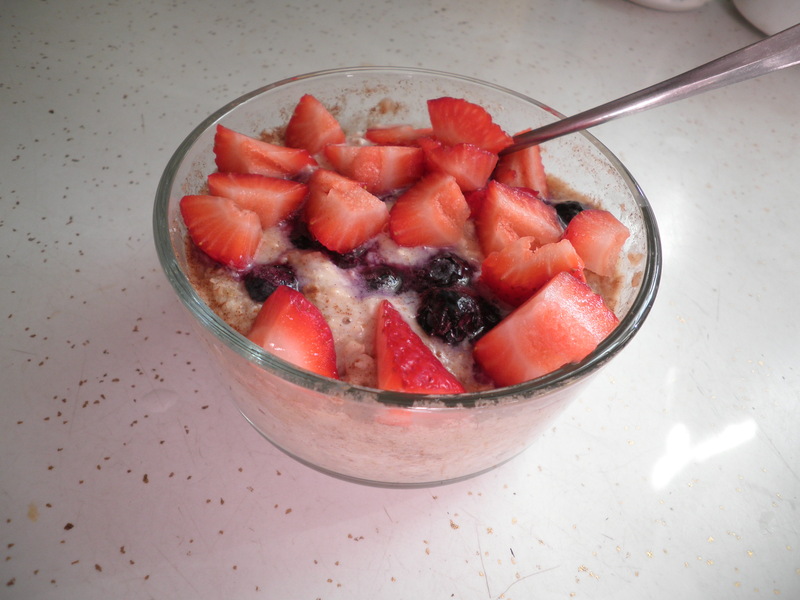 In my efforts to get myself back on track with my eating, I actually put together some overnight oats last night. My usual combo- 1/2 cup oats, 1/3 cup Fat Free vanilla yogurt, 1/2 cup almond milk, frozen blueberries and cinnamon. After a minute and 30 seconds in the microwave (I’m really not a fan of them cold, although I will eat them that way if I have to) I added fresh strawberries. I really need to get myself organized to make this more often. I just have to plan the night before. I enjoy them so much. Need to come up with some variations, too. I had finished my oats and was doing some chores when Ralph said, “I want to go out to lunch, where would you like to go?” It was 11am! Now, I always have to consider the fact that I’m weighing in on Saturday. I decided I could go to the diner, have breakfast and not do too much damage. And without knowing it…I was celebrating Second Breakfast Day! 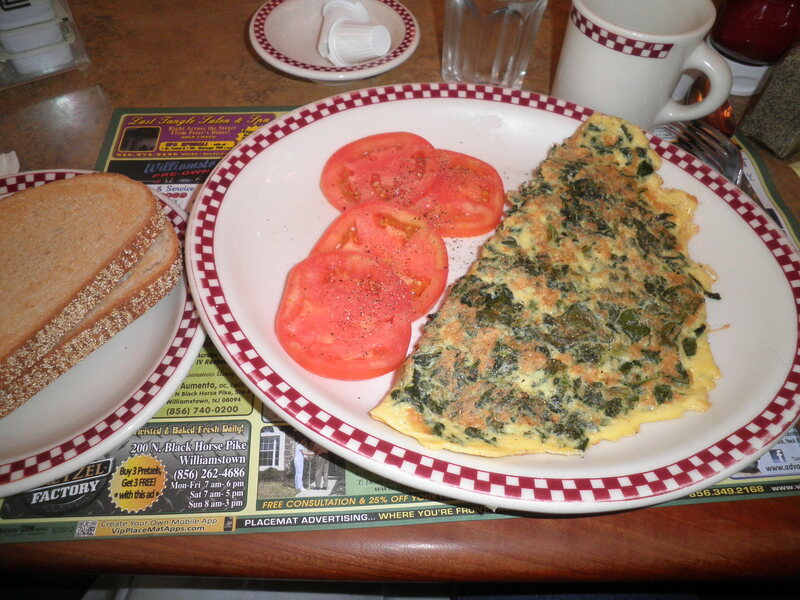 I had a spinach and American cheese omelette with sliced tomatoes and dry rye toast. It really was very tasty. I often will have an omelette at a diner for lunch or dinner. It’s easier to calculate the Points for this than it is for some other menu choices. Besides…I really like omelettes! And it was actually a lunch special today so I got a side salad to bring home and Ralph got my dessert…vanilla cake. All were happy! 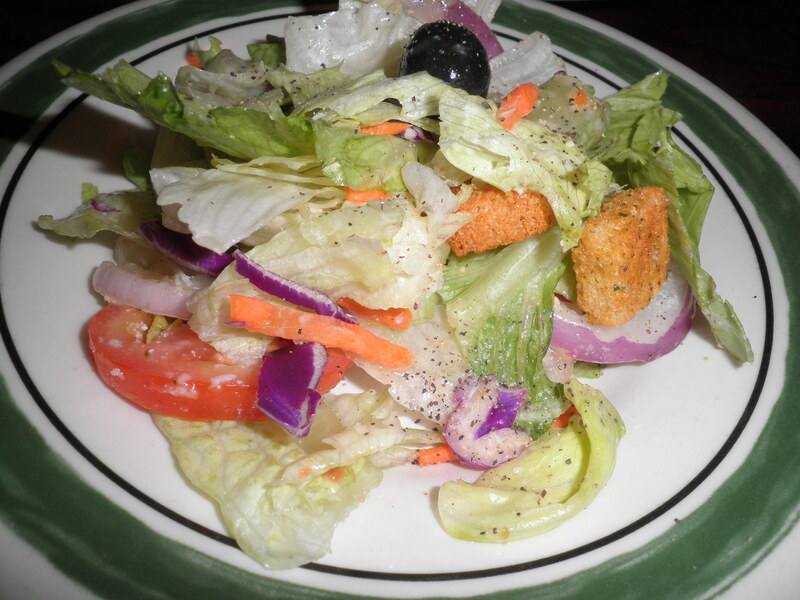 I am so glad to be back in my salad routine again. 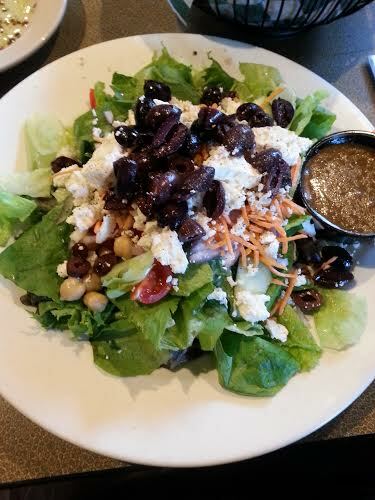 I know I’ve been whining about veggies and salad…but they make me happy. Started by making something I haven’t made in a while. Oh, was I happy with this! Home made dressing-olive oil, balsamic vinegar, honey and Dijon mustard. 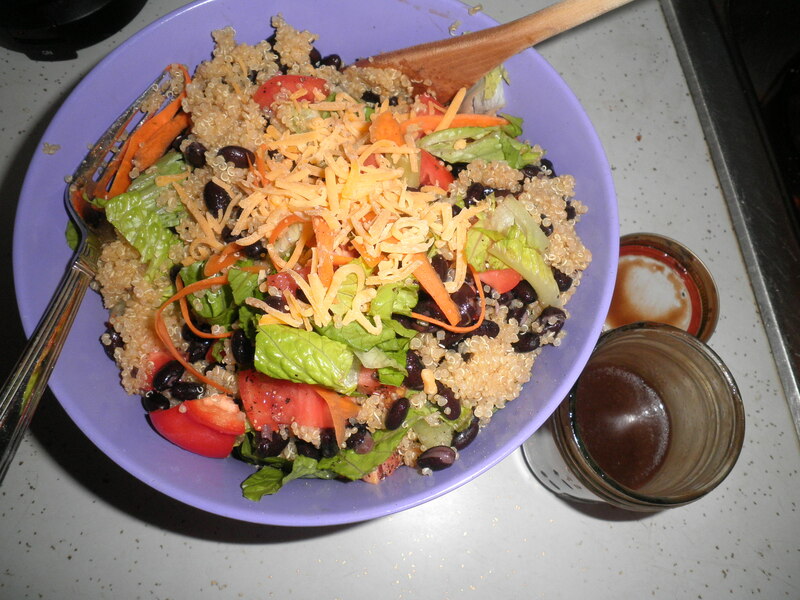 The salad was Romaine, shaved carrots, green and red bell pepper, plum tomatoes, black beans, quinoa and shredded cheddar. It was SO good!! It was filling and helped me stay on track. Another thing that I did to help stay on track-while I was getting the carrots ready for the salad, I peeled and cut some up for snacking later. Also need to do that more often. Funny how we fall in and out of the good habits we’ve developed. I plan on staying On Track and hang on to those good habits. Hoping for a good result at Weight Watchers today. Happy Second Breakfast Day! Onward with the good choices! I feel like I’ve been really on track this week. I’ve used almost all of my Weekly extra points but at least I’m counting and I have an idea what the outcome will be. Actually, I will be Very upset when I get to Weight Watchers this morning if I do NOT have a loss. I’ve worked very hard. But I feel in control and that’s what counts. I mentioned that I was going to show you a special treat that I used to make for my lunches when I was working. Well, I guess it’s not a “treat”…it’s a salad, but that’s always a treat to me! One cup of black beans freshly out of the crock pot. 1 cup of frozen corn, defrosted. However much I felt like of salsa. I used a store brand and probably about a cup and a half, but it’s your choice. I added some garlic powder, some ground black pepper and a bunch of Mrs. Dash Fiesta Lime. I also like it with green Tabasco sauce, but I was out so I improvised. Mix it all together. 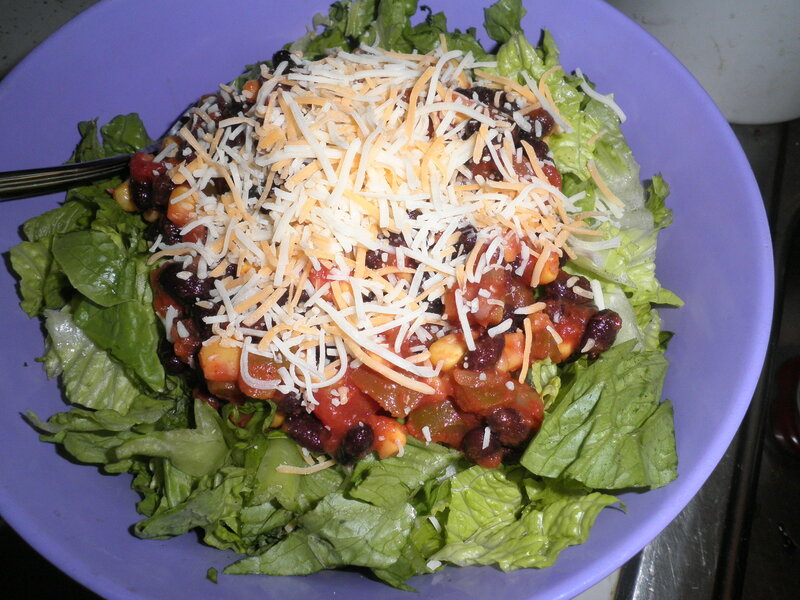 Chopped up a big bowl of Romaine lettuce, topped it with the mixture, then some shredded cheese. This is so simple and so good. It really is a good lunch to go. I would cut up the lettuce in a container with the cheese on top. 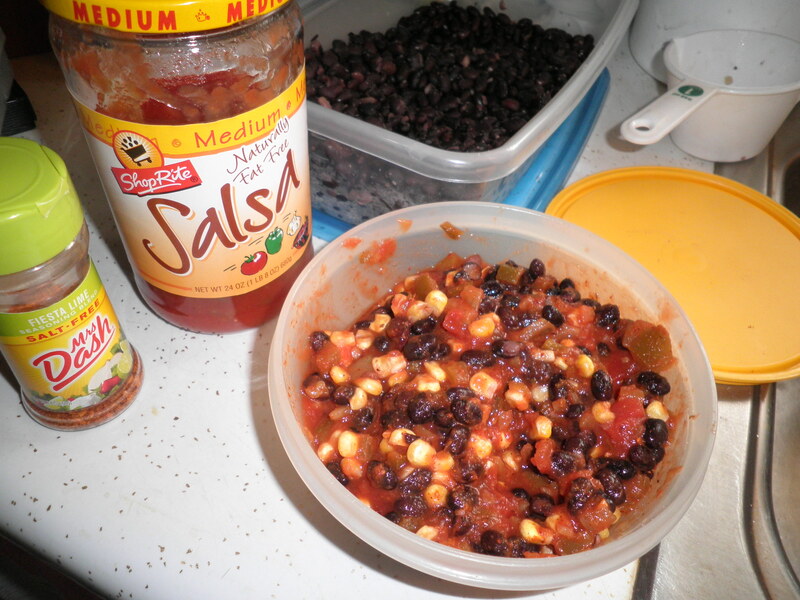 In a separate container, I would put the bean/corn/salsa mix, then mix them together when it was time to eat. It was such a tasty treat when other people were paying way too much for inferior cafeteria food. I got so many comments over the years from people saying how good it looked. It does and it is! 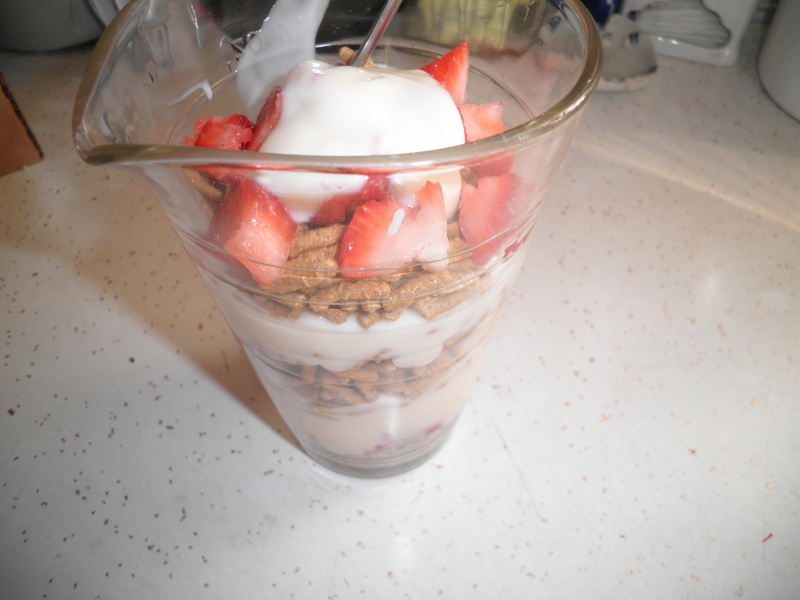 Friday’s breakfast was something I haven’t done in a while…a breakfast parfait! I layered Fiber One, sliced banana, sliced strawberries and fat-free vanilla yogurt. Loaded it all in an old glass measuring cup that was my Grandmother’s. I have two of them and they’re perfect for this type of thing, kind of cool too. So tasty and such a good start to the day! Friday’s lunch was the end of the line for the egg salad I made this week. 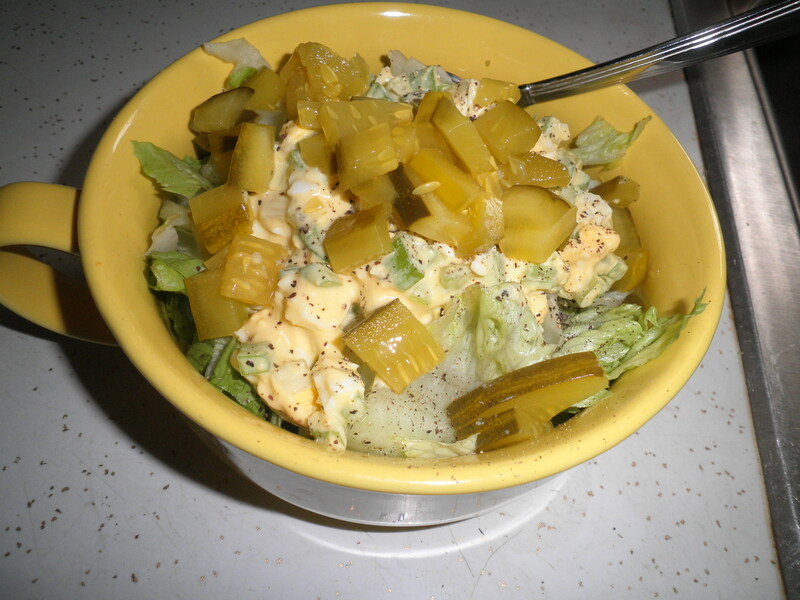 Just chopped up some Romaine and loaded on the salad topped with some ground black pepper and chopped up sweet pickles. This was so good. I like the combo and I think I need to make egg salad again Next week. Oh, wait…I’m going away, guess I better come up with another game plan! Keep your fingers crossed for me at Weight Watchers today. I’m hoping for the best. Then I get to go to Ele’s church rummage sale. That’s always great fun…maybe I’ll find some Treasures! !